font = ms sans serif, font style = bold, size = 14. I am have to change several fields (not all) to this and looking for a faster method than highlighting and clicking on all the info to change. 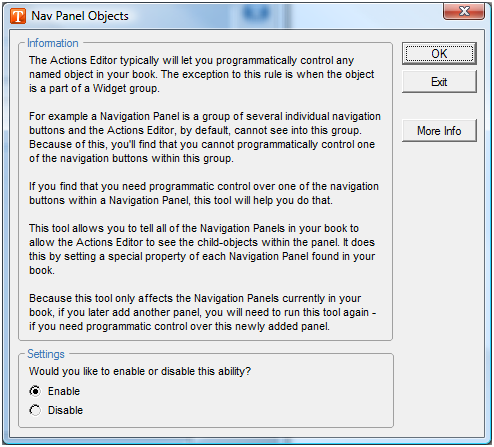 The code below shows how to implement the logic of the “Set SkipNavigation” DevEx tool if you wanted to do it in the Command Window. 18 is the first page number in the range and 29 is the last page number. In DevEx tool itself, you need to read the starting and ending page numbers from fields and do some error checking to make sure the book has that many pages and so forth. But this code shows the main logic. I had this question from one of our Learning & Mastering ToolBook CD customers this morning and thought it would be a good post. I am trying to get a learner to click Ctrl + Page Down to get to the next screen. Where can I find instructions on how to do that? My response: I would try adding an Action at the page level and handling the keyDown event. The first task is to figure out the keyCode for Page Down. 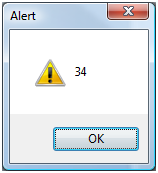 Put in an alert on the keyCode parameter as shown below. You can now Trigger the next page button as shown. This has the advantage of NOT working if that button is disabled, such as when you disable it while they are watching a video. Note that you probably want to put this on the background so that it works on all pages using that background. Be sure to publish to HTML and then test there as sometimes things work differently in the browser. 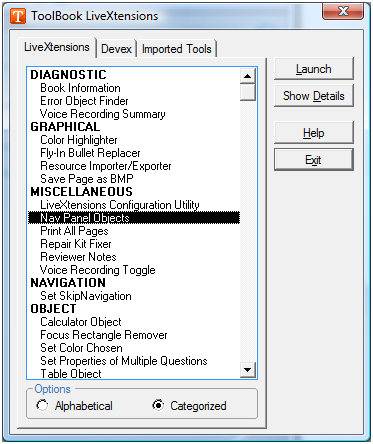 For the ToolBook 11 version of Learning & Mastering ToolBook 11, we wanted to add the “Configuring LiveXtensions” button and associated graphic to a training page. However, the page was programmed to show and hide paint objects. Starting with ToolBook 10.5, however, the option to import paint objects was taken out. Instead, inserting a graphic now creates a bitmap resource and image object. We COULD have converted the other paint objects to resources and image objects, but why do that when we can still get a paint object via OpenScript using the code to below. The only slight snag is that the graphic was originally a .png. That wouldn’t import but the .bmp version worked fine. How would you write a tool like the “Voice Recording Toggle” that is available via LiveXtensions in ToolBook? The first task is to figure out how the enabling happens. If you check the “Enable voice recording playback for this page” box on the Voice Recordings tab of the Properties for Page sheet and then check the User Properties of the page using the Property Browser, you’ll see that it adds a property called TBK_VoiceRecordings. It is true if recordings are enabled and false otherwise. That leads to an implementation from the Command Window like the code below. Notice how we check whether the property of the page is NULL. That keeps us from setting the property where there is no voice recording in the first place. Question: I need to get out of my provincial ways and format dates appropriate to the local preference (i.e., US, European, etc). Are there any functions I could take advantage of in ToolBook to make my path easier for localization of date formats? The function below from our TBK Tracker product should be helpful. In early versions, we ran into problems with dates stored in an Access database on the user’s machine being in a different format than what we expected in ToolBook. This was particularly true in regions that put the day first (25/2/2014 as opposed to 2/25/2014). chars offsetNum to (offsetNum + 3) of newFormat = "y"
You can skip the “ASP” part. The rest reads the registry and uses that to set the s_originalSysDateFormat system variable. When it comes time to display a date, we temporarily set sysDateFormat to this variable. The rest of the time, we set sysDateFormat to “seconds” since we use the sysDate for time tracking. You likely could just set sysDateFormat once. Question: Does anyone know how to eliminate the “Save current changes?” message when the user hyperlinks from one book to another? saveOnClose of this book = "No"
saveOnClose of this book = "Ask"